My mother and father’s kitchen is decidedly low-tech, but during my recent visit home, they were proudly showing off to me — with wide-eyed amazement as much as parental pride — their soymilk machine. What I thought was a much-needed, new coffeemaker turned out be an all-in-one soybean grinder, strainer and cooker. Like any proper immigrant’s appliance, it still sported all its labels and the manual was nowhere to be found. But my parents were happy to provide a demonstration: load soaked beans here, pour water in there, push the button, and waitâ€¦ten minutes. The next thing I know, I can smell that same warm, beany smell that once permeated our house on Sunday mornings. Back then, though, there were big pots to stir, endless batches of blender mush to empty and acres upon acres of cheesecloth to wash. Now, all I had to do was pour out the hot milk and pop a couple of plastic parts into the dishwasher. Welcome to the 21st century! For those of us who grew up with still-warm soymilk, the walls of colorful, aseptic boxes in grocery stores can be somewhat bewildering. I still prefer the unsweetened jugs that are delivered daily to Asian markets, and fortunately for me, I live in a city where I can find it easily. Its flavor is not for everyone, especially those accustomed to ChocoSoy or Soy Frappucino, as no attempt is made to mask its humble leguminous origin. If your family uses soymilk or tofu regularly, consider investing in a soymilk machine. Or, if you’re one of those curious cooks who like to try everything once, making soymilk the old-fashioned way will help you appreciate, deeply, the convenience of supermarkets. 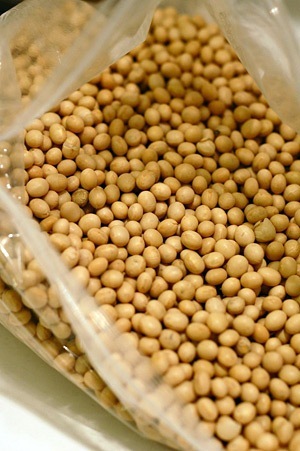 Stop by your friendly neighborhood Asian market for a bag of whole, dried soybeans, or order organic soybeans online from Purcell Mountain Farms. While you’re at it, purchase some nigiri coagulate in order to have a taste of super-fresh tofu, whose silken texture and delicate flavor have moved devotees to heights of poetry. Fresh, hot soymilk, sprinkled with a little salt or sweetened massively with spoonfuls of sugar, is a typical breakfast in Northern China and Taiwan. Accompanied with crisp-fried crullers (look for places that fry these fresh right up front in the store-window), it’s the perfect combination of comforting protein and filling starch that fuels the first few hours of the day. Try it, along with some dumplings and Southern-style jook, at any of these Bay Area restaurants that specialize in Taiwanese-style breakfast. Both my wife and I certainly enjoy our soy! However, since I sat in that kitchen for a week and heard about how I may die some horrific death from consuming unfermented soy gives me pause to crank up the soy milk machine. Any thoughts about this issue will be soytainly be appreciated. Wokdude: Thanks for your comment and questions. But…wow…I’m not even sure where to begin responding to the misinformation involved in both the cooking teacher’s opinions and the very one-sided, strangely manipulative version of the Price Foundation’s soy history and nutrition. For a more balanced attempt to answer questions, please visit http://www.womentowomen.com/nutritionandweightloss/soycontroversy.aspx and http://www.medscape.com/viewarticle/511599. In general, I believe most health professionals will agree with two things: 1) more research needs to be done to substantiate claims for both the helping and hurting powers of soy, and 2) all things in moderation. One thing I will say, though: the belief that unfermented soy will lead to an early death is just plain ridiculous. I’m not the only Asian person (I believe there are a few billion of us!) whose parents and grandparents enjoyed long lives full of yummy tofu. I read the article about soy being slightly poisonous and I have to say that I might be talking from the dead– I ate/eat soy products just about everyday and I seem to be okay. Well anyways, I have a question about a soy machine. I personally have qualms about purchasing a western soy machine product just like how I have qualms about purchasing a rice cooker from Kitchenaid instead of the ol’ trusty Zojirushi or Tiger or something I can pick up at Ranch 99. 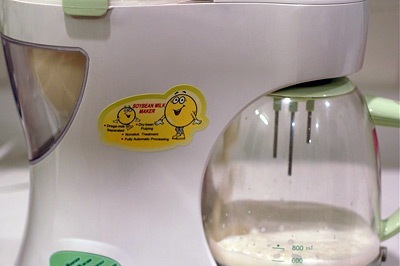 I’ve been browsing around for a soy, rice, almond milk maker for some time and since I don’t live close to a ranch 99 or a China Town or a Japan Town, could you tell me the brand of the soy machine your parents purchased. I’m sure they have trusty taste in products. There are lots of other brands and models out there, of course. One of these days, I’ll have to test a few of them out…. Wow, this is the exact machine I just picked up at my local Goodwill for under $5! No manual though 🙁 Can you share how much beans and water is used in your parents’ machine? I can’t wait to start making my own!